But in Three Little Woods, we have a special plot of sugar cane which we convert into fuel to power our cars. So we have special cars made especially to run on fuels made from plants and vegetable oils. These are renewable sources of energy as they come from plant sources, unlike the Fossil fuels which when used are gone forever. Fossil fuels are ancient fossils and Carbon Dioxide trapped in the Earth. 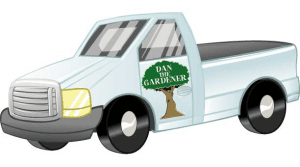 For my Gardening work I use my pickup truck to transport the equipment I use and it also has room for Skipper The Dog, Recycle Michael and that grumpy Lawn Mower Rusty.